Israeli cats match the terrain here. Supposedly they were brought over by the British to control the rat problem, but now they are true Israelis. They are tough and not to be trifled with. I have heard horror stories, urban legends involving cats. About a really macho, former big-deal guy in the army who got a cat bite, wasn't gonna go to the hospital, finally after much nagging did go to the hospital, and then was told that had he not gone to the hospital he would have died. And yet, for non-Israelis, the cats are cuddly-cute. Even in the ulpan, people took care of them and in anglo-heavy neighborhoods like Baka, cat kibble is left out. True story: at an outdoor cafe in the chic Tel Aviv, my little sister scooped up a cat and put it in her lap. 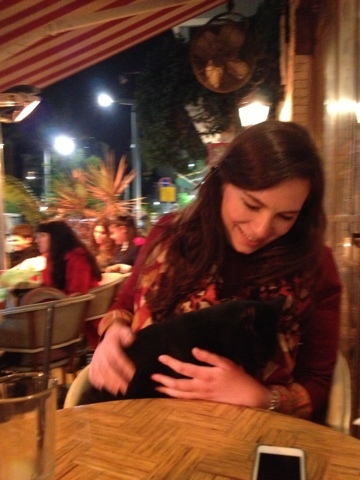 PUT A STRAY TEL AVIV CAT IN HER LAP!!! The cafe goers were all horrified, but she insisted it was clean. The cat jumped on the table and its tail swooshed by the sugar packets. I've seen where those cats go, and I was terrified it would touch me. This brings me to the great cat divide: Israelis do not understand Americans' obsession with the cats. Never have, never will. They do not get why we find them so cute, so adorable, so cuddly-wuddly. I am sure the lack of understanding between the two sides is indicative of something larger. My sister and I went out with some Israelis and we were discussing the cat situation and the events of the past few days. My sister was saying how she wanted to get a cat now for sure. We were drinking choco (hot chocolate), sachlev and milk shakes on a Saturday night. "Now squirrels," said one of the Israeli girls who had spent a year in Ohio. "Now those are funny."